I created this card for Imagine Crafts. We were to create a card with a theme, picking one of the new Kaleidacolor pad names as the theme. 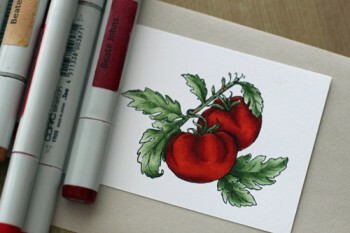 I knew I wanted to use Flourishes Italian Garden tomato image for my card. 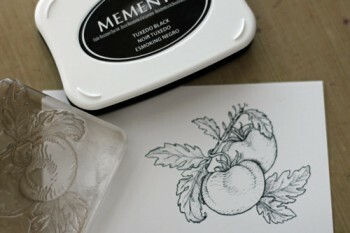 Stamp image in Tuxedo Black Memento Ink. Color image with Copic Markers (YR09, R24, R29, R39, YG61, YG63, YG67, E31, E33, E35) and cut out. Brayer Pistachio Memento Ink over the inside of the Flora M-Bossabilities folder and emboss a 2 1/2″ x 4 3/8″ piece of white cardstock. 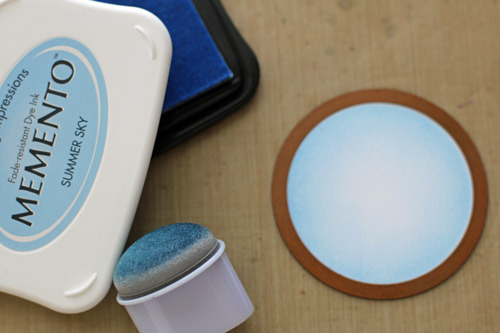 Cut and emboss a piece of white cardstock with the 3rd largest Standard Circle Nestabilities die and sponge the edges of the circle with Summer Sky Memento Ink. Adhere image over the circle with dimensional adhesive. Stitch embossed background to a slightly bigger piece of black cardstock. Tie ribbon around the lower edge of the embossed layer and tape circle to the lower right of that layer. Stamp sentiment on lower left of the card base (3 1/2″ x 11″ piece of white cardstock, folded in half) with Tuxedo Black Memento Ink. 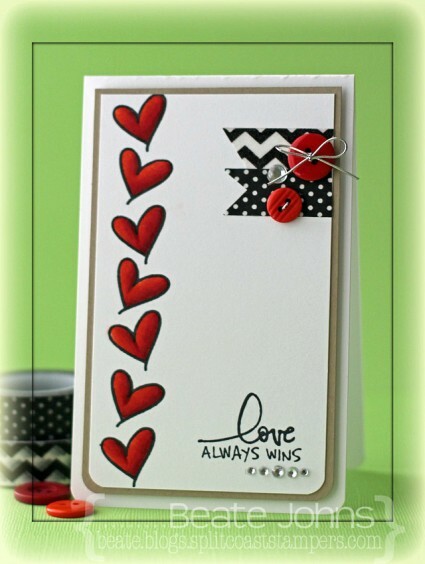 Finish off the card with black rhinestones. Thanks so much for coming by! Have a wonderful day! Yesterday’s tutorial on Splitcoaststampers was written by Joan Ervin. She showcased the Triple Stamping technique. It’s an easy way to add dimension to your card. 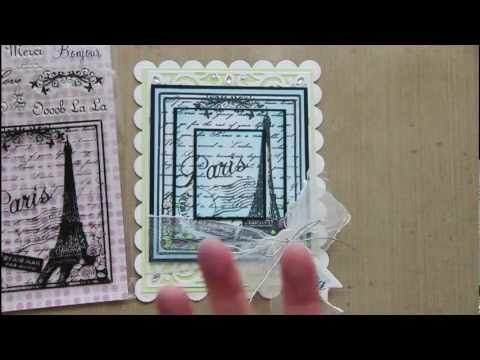 I created a card with that technique with the beautiful Sweet ‘n Sassy Stamp To Paris with Love. I started by cutting three pieces of Neenah Solar White cardstock in rectangles ( 3 1/2″ x 3 15/16″, 2 1/2″ x 2 15/16″ and 1 1/2″ x 1 15/16″). The layers were adhered on top of each other with repositionable adhesive and the image was stamped over it in Tuxedo Black Memento Ink. The flowers of the image were colored with Copic Markers (R11, R12, R22, YG01, YG03, YG17). The frame and the flowers were colored with white crayon before the edges were sponged with Summer Sky and Bahama Blue Memento Ink. Each layer was adhered to a 3/16″ bigger piece of black cardstock. The layers were stacked on top of each other with foam adhesive squares. A piece of Solar White cardstock was cut and embossed with a die from the new Spellbinders Filigree Delight set and adhered to a piece of Limeade Bazzill cardstock. The image layers were adhered over it with more foam adhesive squares and May Arts ribbon was tied around the lower part. 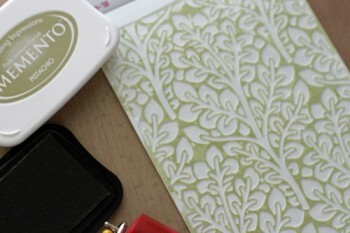 More white cardstock was cut and embossed with a tag die from the new Charmed I’m Sure Spellbinders die set. 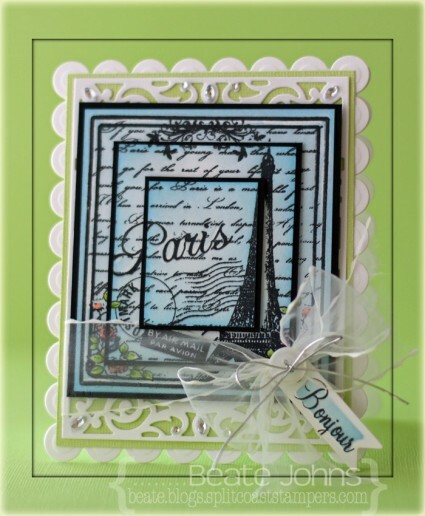 A sentiment from the set was stamped on it with Tuxedo Black ink and the center was sponged with Summer Sky Memento ink. The tag was tied to the bow and a button with silver cord. 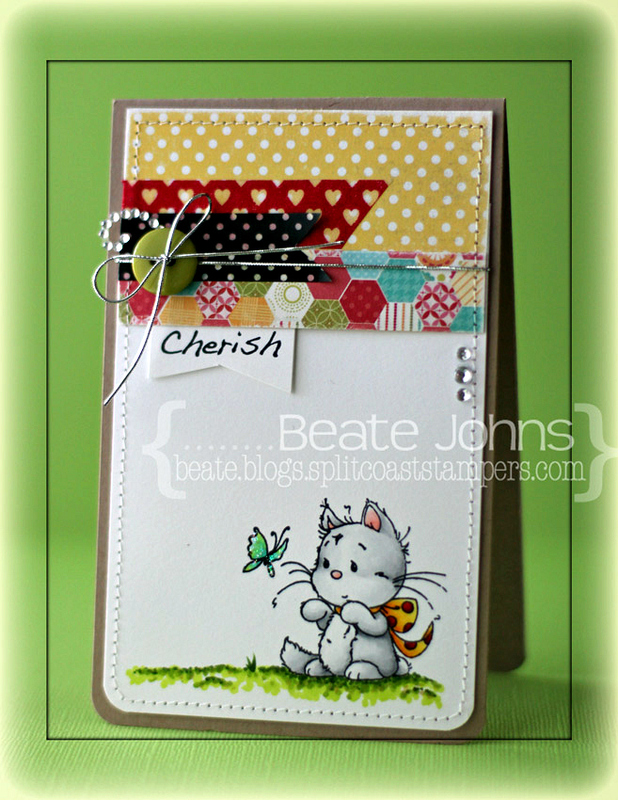 The layers were adhered to a card base cut and embossed out of white cardstock with a Grand Rectangle Nestabilities die. Rhinestones from Want2Scrap finish off the card. My turn to share another card on the Spellbinders blog today. I hope you have time to check out the entire card and let me know what you think. The image was colored with Copic Markers (Roses: R10, R11, R22 Rose leaves: G40, G43, G46 Violets: Y11, Y13, Y15, E99 Violet Leaves: YG01, YG03, YG17 Berries: R27). I stamped Rose and Felix in Tuxedo Black Memento Ink on Neenah Classic White cardstock The image was cut and embossed with Spellbinders Classic Frame die and colored with Copic Markers (Skin: E0000, E00, BV00 Hair: E97, E99, E25, E29 Dress: B41, B52, B45, C0, C2 Skirt: YR30, YR31, Y21 Roses and Belt: R22, R27, R29 Flowers: Y15, Y17, R22, R27 Leaves: YG01, YG03, YG17 Felix: E31, E33, E34 Background: B0000, B000, B00). Another frame was cut and embossed out of Textured Kraft cardstock. The frame was sponged lightly with Vintage Photo Distress ink. The outer edge of the image layer was paper pierced before it was adhered over the Kraft cardstock frame. A 2 1/2″ x 4″ strip of October Afternoon Sidewalks Paper was stitched to a 4″ x 5 1/4″ piece of the same paper pack, that had the bottom two corners rounded. White organdy Ribbon was tied around the horizontal strip. The bow was topped with a button, tied on with iridescent curling Ribbon. The layers were adhered to the card base, a 4 1/4″ x 11″ piece of Solar White cardstock folded in half. The frame was adhered in it’s center with dimensionals. Part of a Finesse Rhinestone Swirl was adhered under the bow and Rhinestones from a 72 Count Rhinestone pack were added to the frame to finish off the card. 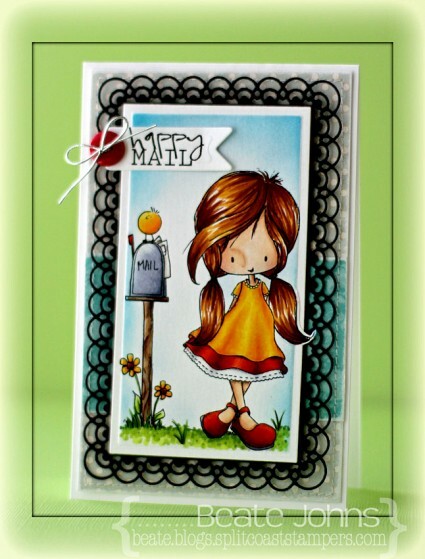 Did you see the new images Tiddly Inks released? They are so cute. For my card I used the new Happy Mail images. They were arranged, printed out on Neenah Solar White cardstock and cut and embossed with the Out of the Box Technique as well as the second smallest of the new 5″ x 7″ Matting Basics A Spellbinders Paper Arts. 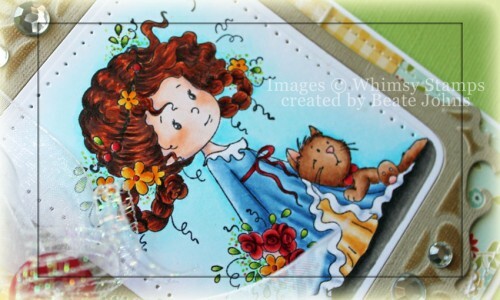 The image was colored with Copic Markers (Skin: E50, E21, E33, R20 Hair: YR24, E99, E39, E18 Dress/Bird/Flower: Y13, Y15, Y17, YR15 Mailbox: E31, E34, E29, W3, W5, BV20, BV23, BV25 Flower Center: E99, E09 Grass: YG01, YG03, YG17) and the edges were sponged first with Summer Sky, then with Bahama Blue Memento Ink. The image was adhered to a piece of black cardstock that had been cut and embossed with the second smallest of the new 5″ x 7″ Detailed Scallops Spellbinders die. A 2″ x 3 5/16″ piece of My Mind’s Eye Six by Six A Mother’s Love was adhered to a 3 5/16″ x 5 5/16″ piece from the same paper pack. The edges were sanded and stitched before the layers were adhered to the card base, a 3 1/2″ x 11″ piece of Solar White cardstock, folded in half. 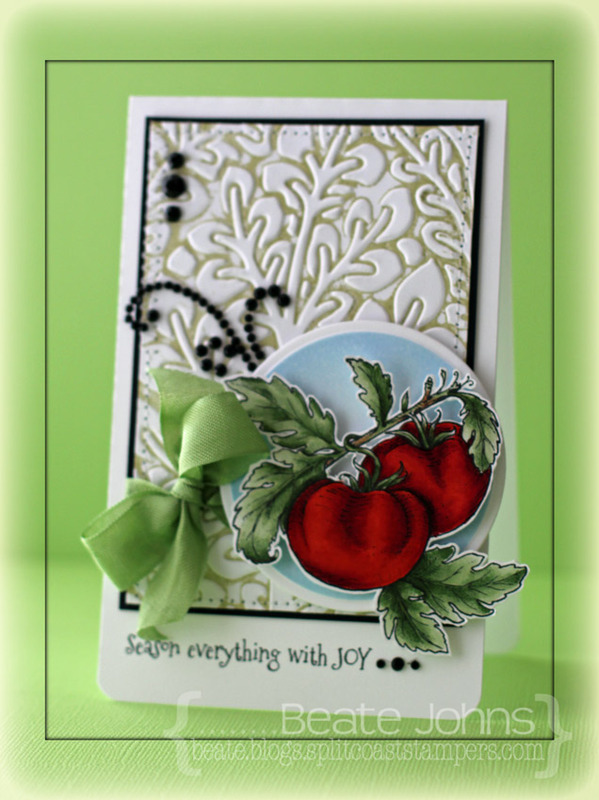 The sentiment from Happy Mail was printed out and cut and embossed with a new die from the Charmed I’m Sure Spellbinders Shapeabilities® die. A button was tied to the left hand side of the tag with silver cord before it was adhered to the upper right hand corner of the image layer. 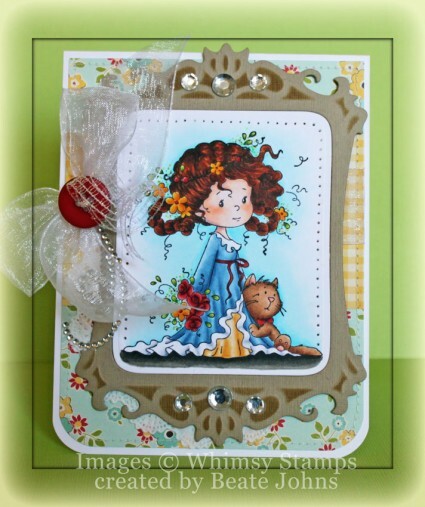 The card works wonderful the current Tiddly Inks Challenge (anything goes. 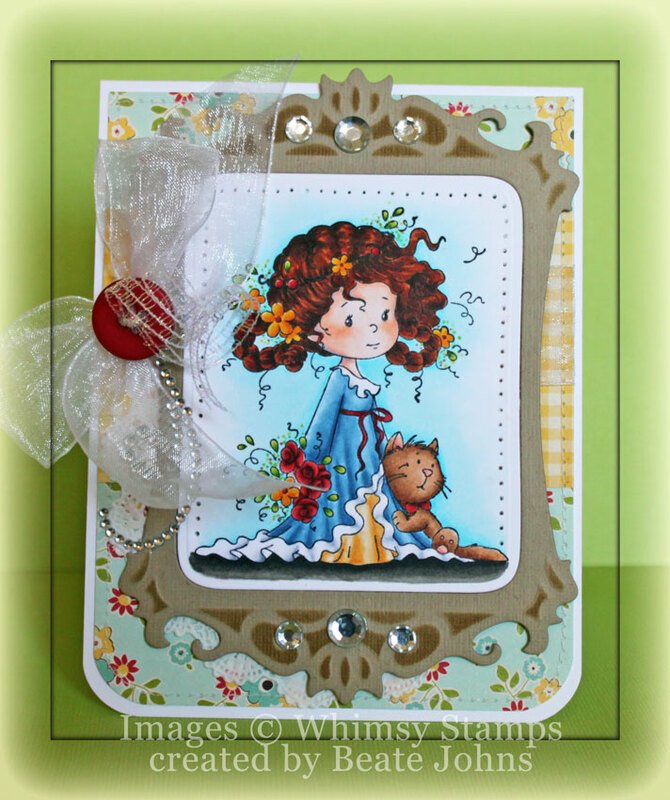 I have another post on the Spellbinders blog today. I hope you have time to check out the entire card. It works great for the current Simon Says Stamp challenge, which is to create a Christmas project. Thanks so much for stopping by! I don’t know how much I will be posting over the weekend and next week! I wish you all a wonderful Christmas. Hopefully you get to spend it with loved ones!!! 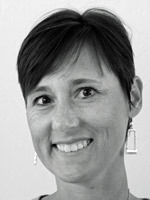 I am exciting to be guest designing for Tiddly Ink this month. For my first card I decided to use the darling Winter Wryn image. I printed her out on Neenah Solar White cardstock and colored her with Copic Markers (Coat/Hat: YR09, R24, R29, R39 Hat/coat trim: W00, W1, W2 Skin: E50, E21, E34 Hair: Y21, Y23, E31, E33 Boots: C1, C3, C5, C7, C9). The cardstock was cut down to 5 1/4″ length and the left hand side was cut with the Notebook Die-namics die. The right hand corner was rounded. A piece of Carta Bella Merry & Bright paper was adhered on the left to form a 3 1/4″ x 5 1/4″ layer. It was adhered to the card base, a 3 1/2″ x 11″ piece of Kraft cardstock, folded in half. Both bottom corners were rounded. 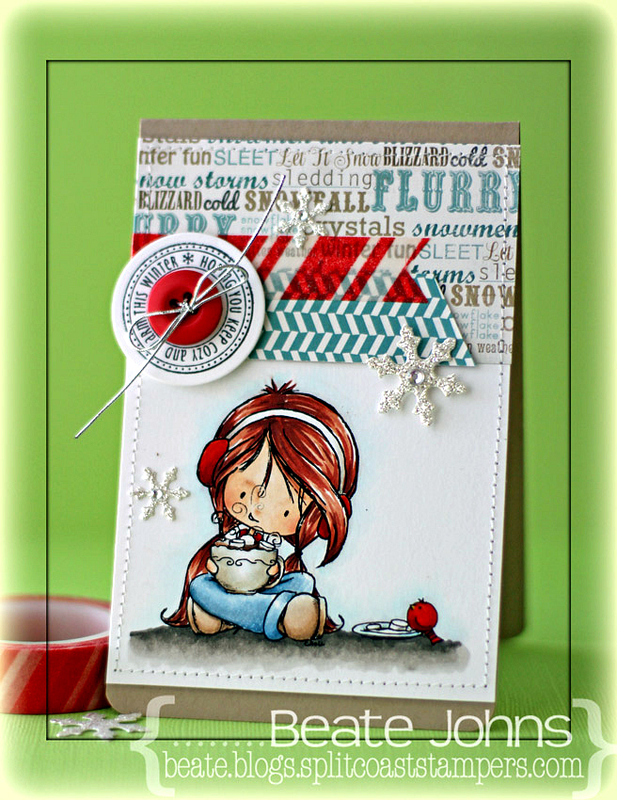 A sentiment from Kelli Purkey’s Joy stamp set was stamped in Sea Breeze VersaMagic ink on white cardstock. It was embossed with iridescent ice embossing powder and cut out. Hemp cord was wrapped into a bow and tied together with a bow. The sentiment was taped under it and it was adhered to the upper right hand side. Do you have any Tiddly Ink images? They are so cute and so much to color.